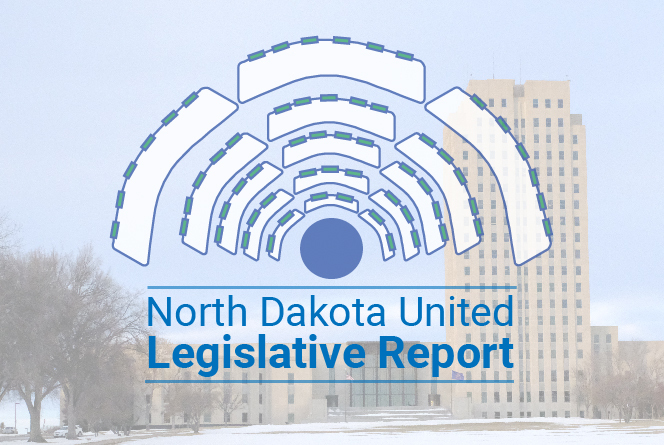 My first and only admission this week is that we don’t have a North Dakota United Legislative Update video to share with all you lovely people. Normally, President Nick Archuleta and Director of Public Affairs Tom Gerhardt talk all things legislative in front of a camera on Fridays. Due to technical difficulties, that didn’t happen. That’s the bad news. North Dakota United Director of Public Affairs Tom Gerhardt, left, and President Nick Archuleta discuss the Legislative Update at 2019 East Regional Assembly in Fargo. The good news is we held our 2019 East Regional Assembly this Saturday in Fargo, and Nick and Tom presented a Legislative Update live, in front of a studio audience (wasn’t really a studio, it was a hotel ballroom, but certainly a great audience of NDU members), and I’ve got some photos and notes from what they had to say to (legislative) report out to you now. That’s pretty great, right? So, remember how last week, we told you that HB 1206, a bill “relating to possession of a concealed firearm or dangerous weapon at a public gathering,” had failed in the Senate, 11-36? And that it might come back as an amendment on another bill? Yeah, that happened. SB 2172​ was amended to include that language from HB 1206 that will create a Class 1 “exempt” license to carry a concealed firearm at public gatherings including schools, churches, athletic events and publicly owned or operated buildings. “We’ve heard back from public employees and teachers and everybody else that says they don’t want guns in their workplace,” President Archuleta said. If passed, this bill would threaten the safety of our communities and make it very difficult for law enforcement responding in an active shooter situation to know how many individuals may be carrying concealed firearms. Please email your representative now and let them know you oppose SB 2172 and don’t want concealed firearms in our schools and public buildings. 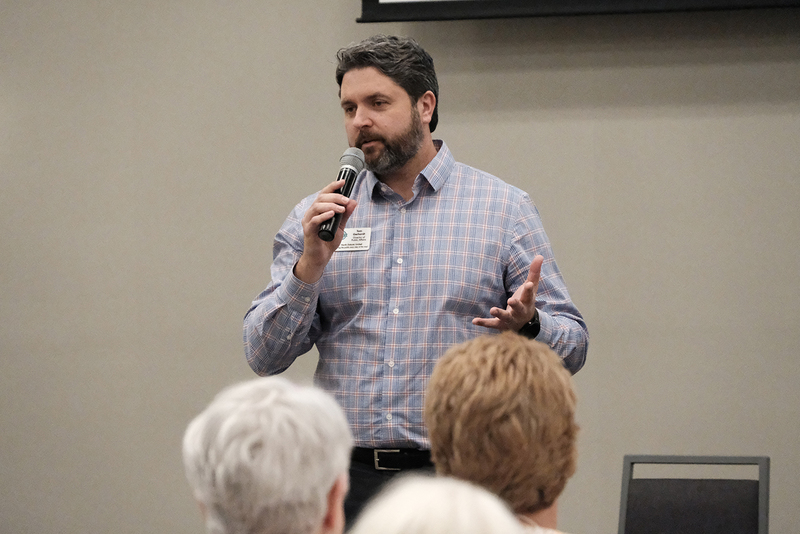 There were three bills, originating from the Senate, that were meant to shore up the ND Public Employee Retirement System (NDPERS) defined-benefit pension plan for public employees: SB 2046, 2047, 2048. We supported one of these — SB 2048 — because it did the right thing, and increased the contribution rates of both employee and employer by one percent, and would have put the fund back on a trajectory to being fully funded. We opposed the other two ideas, to decrease the multiplier that determines future recipients’ benefit received, which is in SB 2047, and to strip the health care credit from future workers, which is in SB 2046.
that bad language went right back in. Thankfully, the language was stripped out, again. The House voted Monday on this bill, and it passed, 87-3. Here’s a new section of the Legislative Report I just made up on the spot. Part of the beauty of hosting a Legislative Update in front of our members at Regional Assembly is that Nick and Tom could take questions. And “since you asked …” we can share that answer with you here. Really pay attention to this inaugural edition of “Since You Asked …”; I think it’s going to take off in a big way. Or I’ll forget to do another one next week. 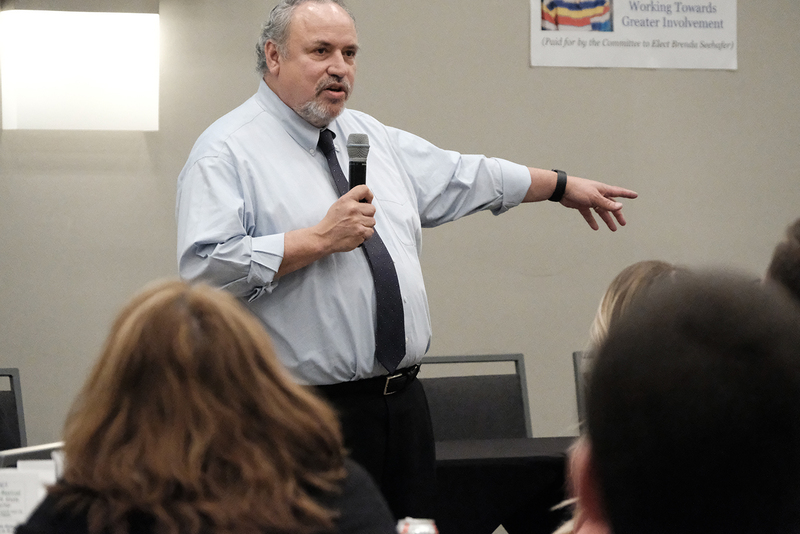 A: “The administrators group, the North Dakota Council of Education Leaders, came up with this idea that, rather than recording contact time in days, we should be doing it by hours,” President Archuleta said. 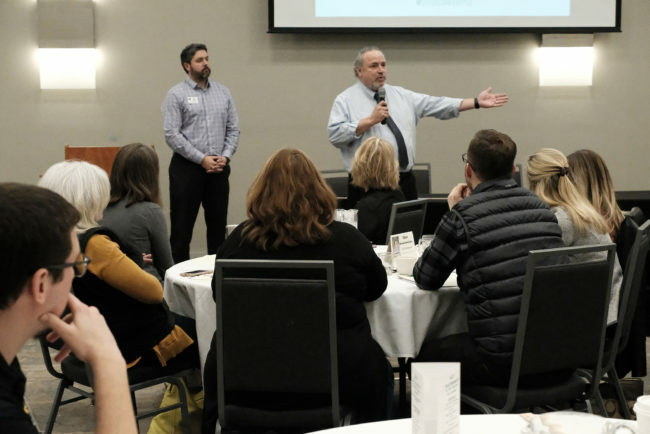 “And the thought there was, if we did it by hours, they could have more professional development time, and they wouldn’t have to go to the Governor to get excused for the storm days. You saw how many of those storm days we had this year. … The problem with this is that, if it was taken to its extent, you could end up with 14 fewer contact days with students a year. The House passed this bill, 86-5, on Jan. 31. The Senate amended it, and passed their version of the bill, 46-0. A conference committee will ultimately iron out the wrinkles. So, yeah. I’m Kelly Hagen, NDU communications director, and I’m almost out of words. 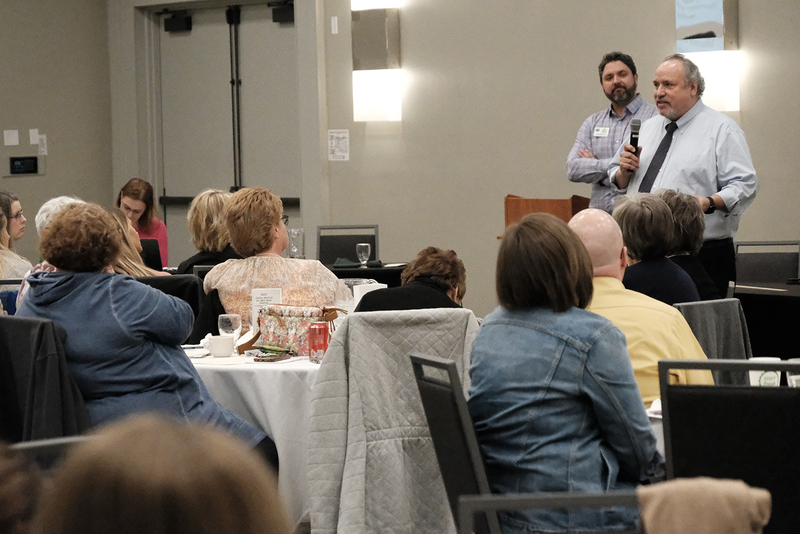 I have just enough of them left to tell you about our 2019 West Regional Assembly in Bismarck, at the Radisson Inn, on Saturday, April 13, with a social the night before. It’ll be way, way, so much fun, I assure you, and informative, too.